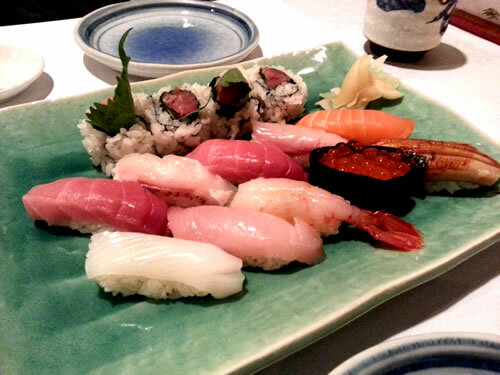 Zen Japanese Restaurant is located on Eglinton Avenue East in Scarborough – just east of Danforth. Please read our conversational review, below. 7.0 / 10Some better than average sushi but overall just an okay experience. 7.0 / 10Hit and miss dishes – albeit a nice place that was unexpected for a Scarborough strip mall. We are back at Zen Japanese Restaurant after getting denied on our previous attempt due to not having reservations! This time around we won’t be denied, as we were smart enough plan and make a reservation for us for 7pm. If I recall correctly, this is probably the first or second time in the history of Sushi Toronto where we’ve actually had to call ahead and make a reservation?!? Ha there’s nothing like getting a “relaxing” massage after some sushi! So, we were seated right away and it wasn’t nearly as busy as last time. I would bet that we could have just walked in without reservations tonight but better to be safe then sorry. The place is pretty small with some tables, a couple of private type rooms with benches and the sushi bar at the back which was full of people on stools eating whatever the sushi chef dropped on their plates. It’s a nice little place. Fairly cozy. You instantly forget your in a Scarborough strip mall. We have menus and some warm towels (nice!) almost instantly. There’s a bit of everything on the menu, which we weren’t sure was going to be the case. were noticeably higher as well, especially for the sushi dinners. So, we ended up ordering the Tokujyo (a mix or random nigiri and a few rolls – $30.50), a handroll set consisting of three handrolls ($9.50), a tempura roll (the actual name escapes me?! 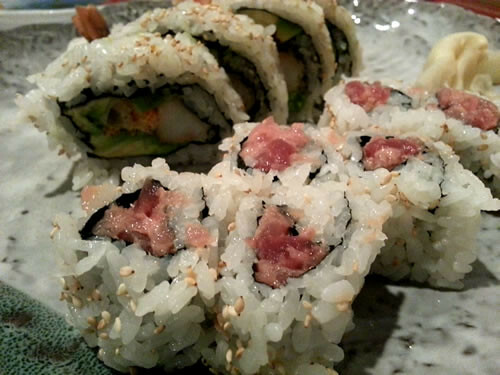 – $9.50) and a spicy tuna roll ($8). Pretty sure the shrimp tempura roll is the “Dynamite Roll”. We originally wanted the Spider Rolls but they were out of soft shell crab. First to come out… the miso soup that came with the Tokujyo dinner. Since we can’t split that one, I took it. I did tell the waitress that we were going to share everything and sometimes they will actually come out with a miso soup for both of us…sometimes. … not today. No worries, I’m not usually a fan of miso anyway. First up (of the ‘real’ food) was the Tokujyo. The tuna was fantastic. Melt in your mouth. Count me in. The rolls were ‘ok’ – nothing amazing. Then I made the mistake of snagging the calamari nigiri — oops. I wasn’t prepared for how tough it would be. I spent about 5 minutes getting it down. My fault – but if you’re into that, maybe it’s for you! that is prepared already has it in it. Only some sushi places do this and it’s a nice touch. I believe traditionally, wasabi is always included in Japan. Now comes the three handrolls. 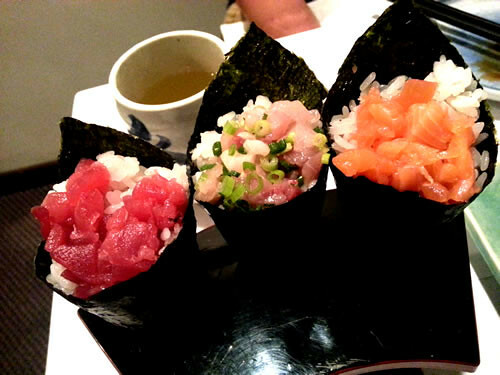 (Tuna, Salmon and ???). They tasted very good and there was ample amount of fish included. True on the fish ‘coverage’. I’m really not a fan of hand rolls (it turns out) — That’s not a shot at Zen though. The seaweed cone is too tough — making it not enjoyable to eat. okay with ample amounts of tuna but the spicy sauce had kind of a weird taste to it that I wasn’t expecting. I guess it’s their own take on it and they do not use the same kind of sauce than what we’ve had at previous restaurants. The dynamite rolls were my favourite dish of the evening, believe it or not. The only issue with them was their size. It’s pretty much impossible to eat it ‘properly’ — at least for this white boy. They were tasty though. I’d get that dish again. The spicy tuna rolls I would not get again. Sorry, have had waaaaaaaaaay better elsewhere. Whatever they’re using in those may be unique, but they’re really not good at all. I was disappointed. If you’re still hungry you can always order that udon soup noodle bowl that the guy sitting beside had and was slurping it like crazy! Hehe… What was a fairly low-key-quiet restaurant experience was then invaded by buddy slurping it down! Alright, so we got the bill. Special note for you credit/debit card lovers: They’ll need to take the hand held system over to the window to get reception for the transaction to actually happen. That’s always fun. I’ll join you @ 7/10. The place was fairly nice; service was decent, but I found the dishes hit and miss. I’d actually head over to Ikki instead, if I was in the area — and could do so without a reservation. 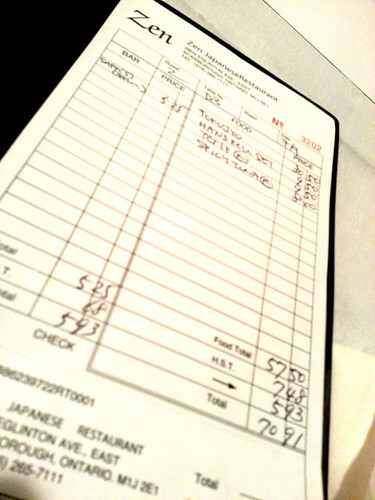 $70+ tax for a bunch of damp rice and raw fish. Owner laughing all the way to the bank.